When comparing tape products made by competing manufacturers, one of the most useful specifications to look at side-by-side is the tape thickness. This number is usually presented in a measurement called a “mil”, short for millimeter, and it is equal to 1/1000 of an inch. While the difference of a single mil between competing products is not visible to the eye, it can have a big impact on performance. For example, a vinyl tape that is 6 mils thick is a full 20% thicker than a 5 mil competitor. 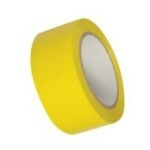 In this case, a single mil can have a huge impact on a tape’s strength, durability and conformability‎.